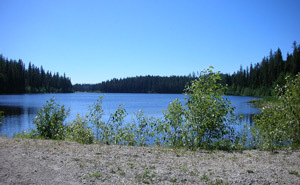 Browne Lake Provincial Park was established May 20, 2004 to protect the Interior Douglas-fir-Montane Spruce transition forest and provides opportunities for non-intensive activities such as nature study and hiking. The park is adjacent to an ecological reserve that protects the upper slopes of this ecosystem. The park does not include the cut-off dam and adjacent land on the north end of the lake. The dam area remains within the user-maintained Forest Recreation Site (FRS), now administered by the Ministry of Tourism, Culture and the Arts. The FRS also covers much of the lake’s shoreline on the east and south sides. The recreational camping site on the south-east side of the lake has approximately 6 spots, and is equipped with outhouses, fire rings, and picnic tables. There is no charge for the use of the sites, and is user maintained. Lake use is mainly trout fishing and associated boating. There is a boat launch at this site. Camping, fires, and motorized vehicle use are prohibited on the north end of the lake within the park. Browne Lake Ecological Reserve is closed to hunting. The Provincial Park, located at the north end of the lake is open to hunting. Please check the BC Hunting and Trapping Regulations for more details. From the city of Kelowna, travel southeast on Hwy. #33 to the Hydraulic (McCulloch Reservoir) Lake Road. Turn west (right) and follow this road 2 km. past Hydraulic Lake. Turn north (right) on Browne Lake Forest Service Road and follow it to Browne Lake. Browne is approximately 46 km. southeast of Kelowna. This park protects a representation of the Interior Douglas-fir-Montane Spruce transition forest. There is limited information available on the rare species in the park. There is a community of yellow-listed Lewisia pymgaea in a rock crop in the adjacent Browne Lake Ecological Reserve. With approximately 2.8 km of waterfront, the park has lots of opportunities for canoeing and kayaking. There are rainbow trout available in Browne Lake. There is a daily quota of two (only one over 50cm). There is no fishing between December 1 and April 30. Only artificial flies on single barbless hooks are allowed, and there is a bait ban in Browne Lake. Please obey posted signs regarding speed and vessel restrictions and ensure you have an appropriate licence. For your own safety and the preservation of the park, obey posted signs and keep to designated trails. Shortcutting on trails destroys plant life and soil structure. There are no maps of hiking trails available at this time. Horses and/or horseback riding are permitted within the park area; please stay on designated trails. There are no lifeguards on duty at provincial parks. A natural gravel beach and cool water makes this park ideal for swimming.